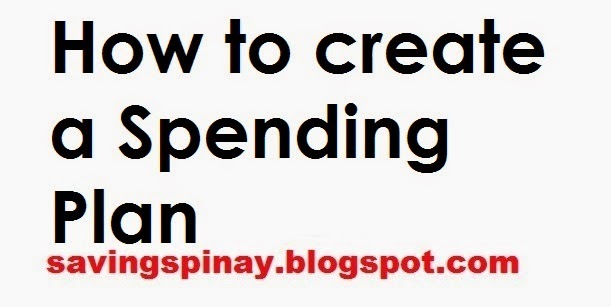 Today’s post is about Creating Spending Plan and it will be nice that before 2014 ends you know exactly how to this basic financial tool. Creating a spending plan is important if you want to determine where your money goes. Even if you don’t set a budget as long as you can easily track down your spendings it will be easier for you to manage your finances. Step 5. Have a Daily/Weekly Review of your baseline. Now that you have successfully created how much you’ll be spending for the what’s’ in your life it is now time to review. Go back to your baseline or your financial net worth and find out if your current spending plan is working towards your benefit or not. If something is wrong or if nothing happens then learn to adjust. Step 6. Have priorities set in your financial life. It is crucial that you become aware on what’s important in your financial life. List down the non-negotiable amount you should pay like rent, transpo, food and credit card debts. This will help you remember that you have to hustle your way to pay the said fees. Clear your priorities in life now if you don’t want to be sorry later.